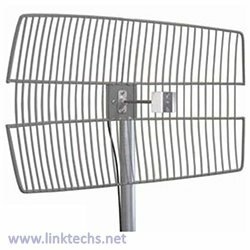 The 5GHz wide band parabolic grid directional antennas offered by Pacific Wireless utilize a unique patented parabolic grid design with compact high performance feed. The antennas are constructed of welded steel wires which are galvanized and then powder coat painted with a light gray epoxy paint. 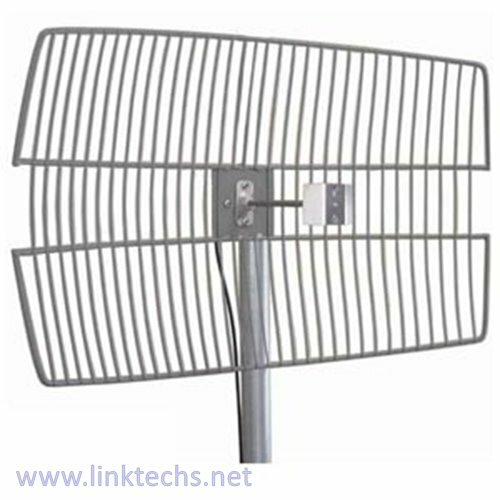 The wire grid semi-parabolic design offers unsurpassed low wind loading while maintaining good RF performance. The compact low visual impact attractive styling blends well in almost any application. Mounting is simplified with the Pacific Wireless bracket system made of galvanized steel with stainless steel hardware. The 25dBi model comes with a super heavy duty bracket system to give even greater stability in high winds. The feed has a 30inch pigtail and N Female connector standard. Other connectors are available upon special request. No product downloads available at this time.